Ethylene glycol is a sweet, odourless liquid that dogs and cats may find quite tasty. Ethylene glycol has a very narrow margin of safety. This means that only a very small amount needs to be ingested in order for it to be toxic and very often fatal. As little as a tablespoon may cause severe acute kidney failure in dogs and as little as one teaspoon may be fatal to cats. Animals are often attracted to ethylene glycol due to its sweet taste. It has a repulsive aftertaste but often the animal has ingested enough of the fluid by the time the aftertaste kicks in, to cause disastrous effects. What are the signs that your animal may have been ingested ethylene glycol? Stage 1: occurs up to 30 minutes after ingestion and includes fatigue, vomiting, incoordination, excessive urination, excessive thirst, low body temperature (hypothermia), seizures and coma. Stage 2: occurs 12 to 24 hours after ingestion. Some of the clinical signs seen in the first 30 minutes may improve but during this stage, the animal may become very dehydrated and develop an increased heart rate and breathing rate. Stage 3: occurs 36 to 72 hours after ingestions. There is generally severe kidney dysfunction at this stage. The dog or cat is generally in much pain and they do not produce urine (this is referred to as anuria). The patient may become more depressed and tired. They may lose their appetite and vomit. They may have a seizure or fall into a coma, which eventually leads to death. How is ethylene glycol toxicity diagnosed? If you suspect that your dog or cat may have ingested antifreeze or any other product containing ethylene glycol, it is important to seek immediate veterinary attention. If your animal is showing any of the clinical signs described, it is important to bring your pet to the vet immediately to be looked at. If there is any possibility that your pet may have been exposed to ethylene glycol but not showing any signs, they should still be brought to the vet. If your pet has vomited or had diarrhoea, collecting a sample to bring to the vet may be beneficial in making a diagnosis. If a diagnosis can be made quickly and supportive treatment is given sooner, the prognosis, although still very poor, is that much better. It is important to provide the veterinarian with a good history with as much detail as possible. The onset of symptoms may give a very important clue as to the potential cause. In some countries, there is a specific test for ethylene glycol toxicity but this is not widely available. The ethylene glycol concentration in the blood also decreases very rapidly so it is important to test as soon as possible after suspected ingestion. Diagnosis is usually made from history, clinical signs and laboratory data. Ethylene glycol is processed or metabolised by the liver into toxic by-products that are damaging to the kidneys. Kidney function is measured by two main products in the blood, namely Creatinine and Blood Urea Nitrogen, both of which are nitrogenous waste products. If the kidneys are not functioning properly, these two products build up in the blood. These levels can be tested relatively easily. They are not a specific test for ethylene glycol poisoning, but they do indicate kidney damage. By the time these levels increase, it is unfortunately very often too late. Looking at the urine may also assist in confirming exposure to ethylene glycol and subsequent kidney damage. The urine is often very dilute and contains blood, proteins and specific crystals. The urine is often acidic. Quick action and treatment are essential if there is any chance of survival. There is an antidote for ethylene glycol toxicity but it is very expensive and unfortunately not readily available in this country. The antidote also needs to be given within five hours of ingestion. Alternative treatment such as ethanol are available but animals need to be monitored closely as the drugs used for treatment have side effects. Sodium bicarbonate administered in the drip will assist with the metabolic acidosis. In suspected cases, supportive treatment is essential and this will include intensive monitoring, fluid therapy to correct dehydration and correction of any pH imbalances in the body. Despite treatment, the prognosis is often grave to poor and many animals do not survive antifreeze poisoning. The old saying, “Prevention is better than cure”, stands true here. It is important to be aware of any household products that contain ethylene glycol and store them safely, away from animals. Clean up any potential spills immediately and if you are unsure of potential exposure seek veterinary care immediately. 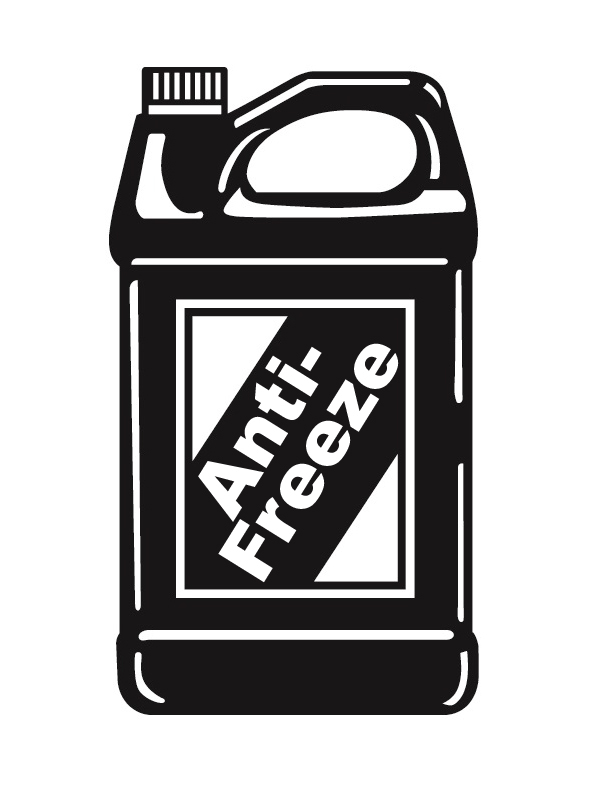 There are many potential threats within a home of which the drinking of antifreeze is only one, and so it is important to be aware of them and take the necessary precautions to safeguard your animals.